Actor describes his homecoming, to appear at the new Birmingham Rep theatre, as “a bit tragic”. He is one of Birmingham’s most famous sons – but it would seem that the love affair is rather one-sided. 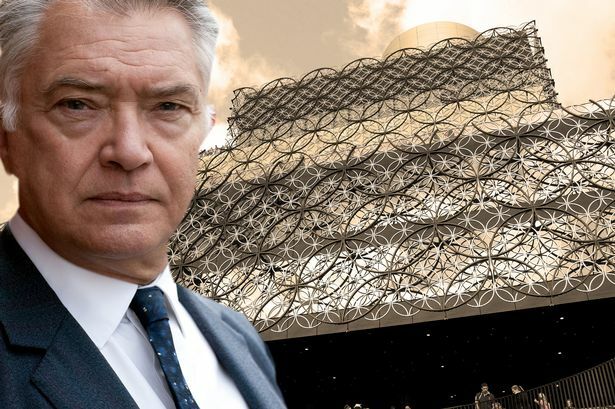 Martin Shaw does not have many nice things to say about his home city, despite returning to star on stage at the Birmingham Rep for the first time in his 50-year career. For a start, he can’t stand the £188 million new Library of Birmingham next door to where we are talking. “I hate it,” the 68-year-old declares vehemently. “It’s monstrous. “Forgive me, I know Birmingham is very proud of it, but in my opinion it has nothing going for it at all. “It’s a very ugly building which dominates the space so emphatically. There are some wonderful buildings around it, like the Hall of Memory, which are overshadowed now. “Maybe it’s a generational thing, as I don’t like change. "There’s no point in my having a nostalgia for Birmingham because the Birmingham I knew has gone. Part of the process of being here is getting over the fact that I don’t know where I am. “In terms of not being stuck in the past and in terms of progress for business, I suppose it is a good thing for the city. But for me, I find it a bit tragic. I really enjoyed the old Birmingham. “I took a stroll round the Jewellery Quarter, where I used to work. It was a rough, industrial area then, now it’s become posh. “My son Luke and I went up to visit my brother Jem, who lives in Stafford, and we came back on the A38. Suddenly I began to know where I was. Martin admits to not yet visiting the Bullring. In fact, he is being guided around his home city by his castmate Robert Vaughn, as the Man from UNCLE star knows modern Birmingham well, having lived here for three summers while filming the TV series Hustle. They are appearing in the classic play Twelve Angry Men, which opens tomorrow and runs for two weeks before a short tour, including Malvern Festival Theatre, and then a West End run until March. “It is extraordinary that I have never worked at the Rep before,” muses Martin, who grew up in Alleyne Grove, Erdington. Martin first appeared on stage at the age of three, as his parents Jo and Frank were involved in amateur dramatics. “I have only a hazy memory of it and have no idea which theatre it was. I was given a straw boater, a paper bag and my dad’s pipe. He tried acting again with more success in his teens, thanks to his drama teacher at Great Barr School, Tom Knowles. “He was a genius who was very interested in Commedia dell’Arte, the Italian theatre of the 16th century. He set up a semi-professional group of strolling players called the Pied Piper Players. When I left school I joined them. “We would meet once a week to come up with scenario and improvise upon it. Then we went out on to the bombsites of Birmingham, dressed as Commedia characters like the Harlequin and playing instruments like a kazoo, to round up some kids and perform for them. Twelve Angry Men is set in New York in 1957. A young man is charged with killing his father and faces the death sentence. Twelve men convene in one claustrophobic room to decide his fate. The ensemble cast also includes Lost star Jeff Fahey, Nick Moran and Miles Richardson. Martin has had plenty of experience of courtrooms. For six years he played Judge John Deed on BBC1, but he’s also appeared in court as himself. He was summoned to a Californian court in 1990 after causing a car crash by going through a red light. “I remember it clearly, because I was so impressed by the judge, called Marion E. Gubler. Then there was the time in 1998 when Martin was attacked by a bus driver. He was left bruised and bleeding, but still pleaded for leniency for the driver. “I was cycling to work and he cut me up, swerving his seven-ton bus towards me. I swore at him and he threw his sandwiches at me. “I cycled after him and stopped the bus. He jumped out and started attacking me. “The law took it very seriously, as he had used his bus as a weapon, but I told the judge he shouldn’t be jailed, as it was just a row between two men and I did chase after him. “The judge still jailed him for 28 days. One of the other jurors in Twelve Angry Men is Martin’s 44-year-old son Luke Shaw. He has worked with all of his actor children – Luke, Joe and Sophie. “I have never succeeded in getting a job for anyone, but I can suggest a role and then they have to audition like everyone else. One man who doesn’t need any acting advice is veteran Robert Vaughn, who’s 80. The last man standing from The Magnificent Seven, Robert is full of stories of old Hollywood. Did he know Henry Fonda, who starred in the 1957 film of Twelve Angry Men? “No, but I knew his daughter Jane,” says Robert. “It was during the anti-Vietnam War movement. “She was a terrible curse on our work. I thought she was terribly out of line when she went to Hanoi in North Vietnam. Robert and Martin have one thing in common – they both starred in iconic TV series which are to be turned into films. But they have very differing views on the subject. Robert is thrilled that The Man From UNCLE movie is being remade starring Superman’s Henry Cavill in his role of agent Napoleon Solo. “Some feelers have come my way about a cameo role, which I would absolutely do, no question,” says Robert. But Martin pulls a face when told the director is Guy Ritchie. “I loathe any film that’s overstyled and where you’re aware of too much directing going on,” is his put-down, before throwing cold water on plans to make a film of The Professionals. Martin is more keen on his current BBC1 series, Inspector George Gently, which returns in January for its sixth series. * Twelve Angry Men plays at Birmingham Rep from October 4-19. For tickets, ring 0121 236 4455 or go to www.birmingham-rep.co.uk .